Red chilli powder - 1tsp. Coriander leaves (chopped) - 2tbsps. Whole Dry Red chillies - 3 nos. Pick and wash all the dals with plenty of water. Then soak in for 25 mins . Drain and leave aside. Peel garlic and chop finely. Boil the dals in water along with turmeric powder and until almost cooked. Add red chilli powder, goda masala and salt. Mix well. Boil for another few minutes to cook the dal properly. Take off from the heat. Heat the ghee in a pan, add cummin seeds and mustard seeds. Cook for a moment. Add chopped garlic and whole dry red chillies and saute until garlic turns brown. Add this to the cooked dal and keep covered for 2-3 minutes. 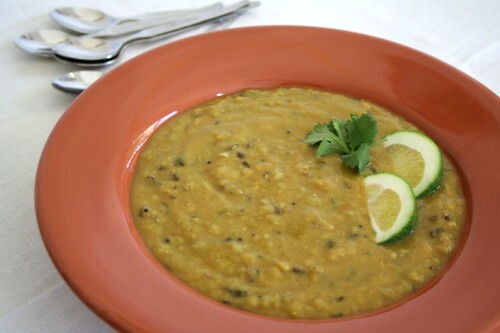 Stir the dal well, garnish with coriander leaves. Making Time: 30 minutes (excluding the soaking time). Serving suggestions: Steamed rice, chapati. Note: This dal tastes best with steamed rice. For goda masala refer masala sections.